KANSAS CITY, Mo.—The world-renowned Shen Yun Performing Arts Touring Company kicked off its first performance at Kauffman Center in downtown Kansas City, Mo. on March 28. The performances run until March 30. 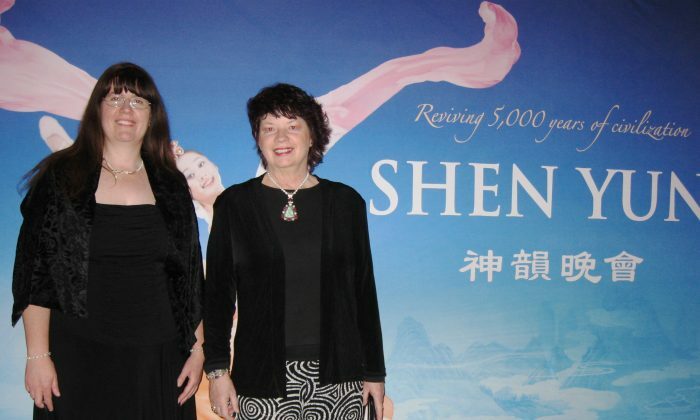 “A Shen Yun performance features the world’s foremost classically trained dancers, a unique orchestra blending East and West, and dazzling animated backdrops,” states Shen Yun’s website. Among those in the audience were dance teachers Donna and Karen House. Donna, a Middle East dance instructor and dance studio owner in Kansas City, was impressed with Shen Yun performance, the dancers, and costumes. According to the Shen Yun website, “Chinese dance is at the heart of what Shen Yun does. Known for its incredible flips and spins, and its gentle elegance, it is one of the most rigorous and expressive art forms in the world. Acrobatics, as we think of the form today, originated from classical Chinese dance. “The drums were very exciting, but I love the costumes with the veils,” said Karen. What impressed her most was the style of dance and the music of the Shen Yun Performing Arts Orchestra which combines traditional western and eastern instruments to create a unique sound. “Well, if I wanted to learn, I would want to learn how to play [the erhu]; it’s beautiful,” she said. Shen Yun brings to the stage a journey of 5,000 years of divinely inspired civilization through the performing arts. Shen Yun’s mission is to revitalize traditional Chinese culture which is synonym for spirituality, a respect for the divine. “I think it’s wonderful, and someone has to continue their heritage and the dance, someone has to keep it alive and hopefully it can turn back to that spiritual” basis, said Donna. Both dancers would recommend Shen Yun to family and friends.